Fresh, Lively Pomodoro Sauce — Tastes Just Picked! Pomodoro sauce, straight from the kitchen of Chef Gorji’s Dallas restaurant. Your family and guests will love that it tastes like you spent hours preparing fresh sauce. But just heat and enjoy! 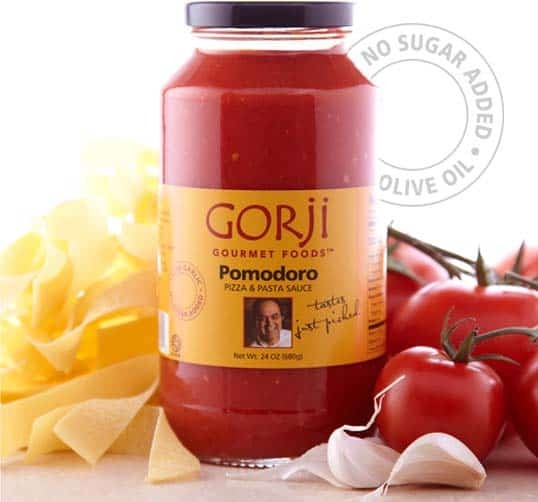 Use vibrant and fresh-flavored Gorji Gourmet Pomodoro in pizza and pasta recipes or dishes calling for marinara sauce. Chef Gorji suggests using this sauce for tomato basil bisque, meatballs, spaghetti, lasagna, eggplant parmesan and any recipes calling for tomato sauce for pasta. For an easy, elegant gourmet dinner just top pasta with it and add parmesan cheese. Eater Dallas includes Gorji's Eggplant and pomodoro sauce in Addison Best Restaurant List article. This fresh tasting tomato sauce has just three simple ingredients: fresh-picked tomatoes, garlic and imported olive oil. 2015, 2016, 2017, 2018 ZESTFEST food competition awards.